How Do Fillings Work? - Adelberg Montalvan Pediatric Dental PC & Orthodontics too! Dental decay can be unsightly and painful in most instances. It is the sugar in foods that you eat collaborating with the bacteria in plaque in order to produce an acid that can begin to erode and destroy the enamel. The body can give its best attempt to neutralize such activity, but this usually takes about an hour during which the harm might be done. Thankfully, the dental fillings are able to help restore much of this if delivered in time, but how do these fillings work? Dental decay can be unsightly and painful in most instances. 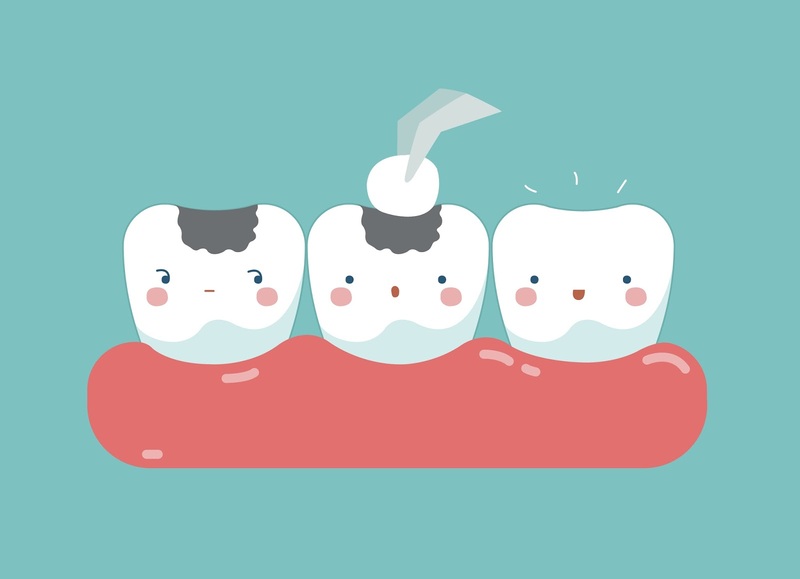 It is the sugar in foods that you eat collaborating with the bacteria in plaque in order to produce an acid that can begin to erode and destroy the enamel. The body can give its best attempt to neutralize such activity, but this usually takes about an hour during which the harm might be done. Thankfully, dental fillings are able to help restore much of this if delivered in time, but how do these fillings work? The precursor to the actual placement of the dental filling is the preparation process that the dentist starts by cutting the tooth using a rotary handpiece and dental burrs.This a great tool for working on tooth enamel because the cutting edges are so small that if the tool accidentally touches the soft tissue of the mouth, it will not cause harm. Those tissues will flex out of the way while the harder enamel cannot do so and gets cut to the desired level. This preparation will continue until the unsound parts of the tooth are removed as well as all lingering dental decay. At the same time, the dental worker will make space for the filling material to be laid.There is a myriad of filling materials that might be used in order to reconstruct and reinforce the tooth after this space has been made.These include things such as amalgam because of its low cost, durability, and strength that makes it one of the more common types of fillings. But, there are alternatives like gold, porcelain, composites, and more that might be used depending on the type and extent of the preparation. Overall, the mouth is a resilient place, and the teeth can be kept in good functional and aesthetic condition if treated in time. We are professionals at preparing for and placing fillings so that they will work effectively. Contact us today!